This 17th Century, listed historic house stands at the heart of the delightful Winchmore Hill Conservation Area. Fast trains to the centre are just 2 minutes walk away & take you in 25 minutes to the West End, theatre-land, shops, tourist sites and museums, and the Eurostar International Terminal. Cafes, restaurants, pubs and shops are nearby on Winchmore Hill Green, which retains the charm of past times, yet is very much part of modern London. We offer family-run accommodation with a friendly welcome. The STABLES COTTAGE: This cosy, romantic cottage is situated in the secluded walled garden of The Old Bakery, with direct, gated access to the street and to Winchmore Hill Green. The Stables cottage consists of a living/dining room, kitchen, shower-room and double bedroom in the eaves. The Stables have their own patio area where out guests enjoy breakfasts among the flowers and romantic evening drinks. We maintain The Stables to a 4**** standard. Egyptian cotton bed-linen & towels are supplied. WiFi is free. 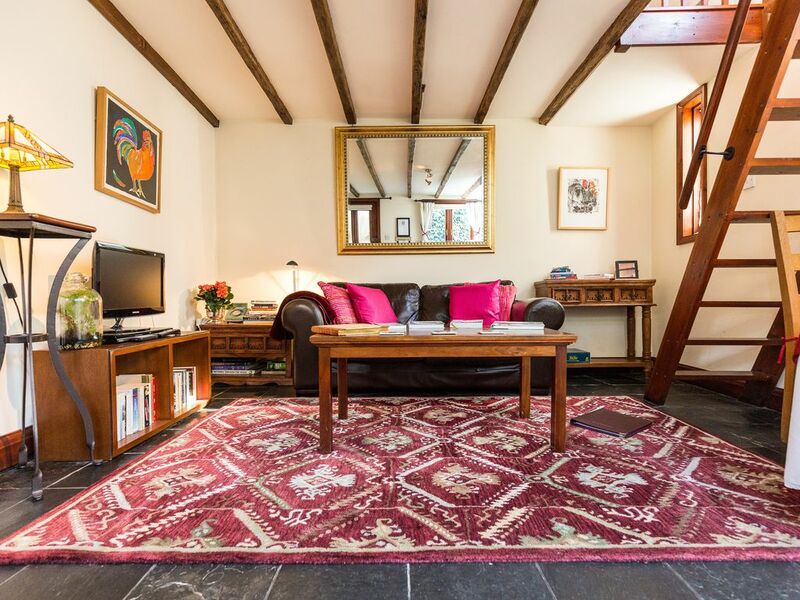 Please note that we also have a larger apartment, CHALKLEY'S, which sleeps 4. The reference for this apartment on Home Away is 8549335. WINCHMORE HILL is a delightful and safe area of London, popular with Londoners because of its excellent, fast train links to the West End and City centre. It was in 1871, when the railway came to Winchmore Hill, that a sleepy village became a commuter suburb of London and prosperous City workers built new homes in streets around the ancient village Green. The Old Bakery is close to the station, just two minutes' walk. The nearby shops, 'Deli-on-the-Green' and 'The Larder', make food buying a pleasure rather than a chore. If you wish to eat out, there are high quality restaurants, cafes and pubs nearby. There is also a large supermarket a short walk from the Old Bakery. Accommodation at The Old Bakery offers you a more relaxing and more economical option to hotels. At The Old Bakery, you have a relaxing home-from-home where you can enjoy the beautiful surroundings before and after your day's site-seeing in the centre of London. You benefit from the flexibility to choose to eat out in one the excellent restaurants on The Green, or to bring home a "take out" and eat it at your dining table, or to cook your meal for yourself in the kitchen. This is a family-run business. We pride ourselves on our personal service and friendly welcome to all our guests. We enjoy sharing the beauty of this historic building with you. THE CONSERVATION AREA: The village origins of Winchmore Hill (first mentioned in the history books in the 14th century as a village on the route to the Royal Hunting Forest) still reveal themselves in the historic buildings around The Green, and in a friendly community atmosphere, unusual in a capital City like London. The Old Bakery is believed to have begun life in about 1595AD as a village hall with central huge fireplace and vaulted ceiling, before becoming, first, a farmhouse, then, in 1822AD, the village Bakehouse, and finally a private home . The Bakery was run for many years by Quakers and Winchmore Hill was an historic a centre of early Quakerism (The Society of Friends). The nearby Quaker Meeting House is still in use, surrounded by a beautiful garden. I brought the Bakery in 1978. Restoring and preserving its historic fabric became a labour of love. Originally we used the whole of the Old Bakery as a family home. My first husband was a classical musician and both our children were studying instruments. So it was well used for rehearsal and practice. My children, Karen and Stephen, are both professional musicians. Stephen plays the cello and Karen the violin. In 1986, Clive died in 1986 and soon my children became adults and had homes and, eventually, families of their own. I decided to divide the house into two parts, thus creating 'Chalkley's' apartment. I converted the Stables to a guest house about ten years ago. My second husband, Bruce, and I met in 1991. We have 10 grandchildren between us! For many years, I worked in Fundraising and raised funds for historic buildings including Worcester College Oxford, The King Charles Court at Royal Greenwich and (my final project) St Paul's Cathedral. I then re-trained as a Psychotherapist and have private practice in Winchmore Hill. My second husband, Bruce, is a scientist working on Environmental issues. Bruce has three adult children and we now have 12 grandchildren between us! The eldest is Zachary aged 20 and the youngest is baby Ethan born in 2015. My son, Stephen and his French wife Amelie (also a musician) have 4 year old twins Elliot and Ariane whom I often look after, which is a real joy. Our children and grandchildren frequently gather here for meals. When there is a birthday to celebrate it is usually a case of 'Let's go to Mum's'. Fortunately, Bruce is an excellent and enthusiastic cook. The photo above is of the family gathering for Zachary's 18th birthday. I am the one wearing a flowery jacket and holding Elliot, aged 3 years. In order round the table, Amelie (back to camera) me, Nat, Zach, Karen, Gabriel (not the baby Gabriel but his older cousin!) Martin (a friend from New York) and Stephen holding Ariane (Elliot's twin sister). Winchmore Hill is a wonderful place to live. It combines fast access to the centre of London with pleasant surroundings, good independently-run shops and restaurants, and a thriving and friendly community. These last qualities are rare in large capital cities.I frequently join local friends at the Deli-on-the-Green for morning coffee, when we talk over local issues, discuss the latest news or have friendly disagreements about politics. In the warmer weather I love to walk in beautiful Grovelands Park. The Park was once the grounds of 18th century Grovelands House (designed by John Adams) but was bought by the far-sighted local Council 100 years ago as a amenity for the neighbourhood. At weekends Bruce and I usually go to the theatre, a concert, or to the National Film Theatre. The great thing about Winchmore Hill is that it is easy to pop into the centre - for a bit of Oxford Street shopping, or to visit Borough Food Market, for example - while also enjoying a great neighbourhood. When I first saw The Old Bakery, the fireplace in Chalkley's dining room brought back childhood memories of my grandfather reading by his newspaper by the fireside in his Tudor period house. I love The Old Bakery's spaciousness, its charm, its excentricities and its warm family atmosphere. When we bought The Old Bakery we spent a lot of time finding the original features hidden beneath inappropriate 'modernisations'. I have taken pride in conserving the building's historic fabric and bringing The Old Bakery's facilities up to high contemporary standards without compromising its character and atmosphere. About ten years ago, I transformed The Stables ( where the baker's horses lived until the1940s) into a delightful one bedroom cottage (also available as a holiday apartment). By thermostatically controlled electric built-in convection heaters with timers. One is each area of the cottage. All bedlinen is hotel quality 400 thread Egyptian cotton; hypo-allergenic duvet. Also a quilt / throw over the duvet. Parking is in the street. We can provide guest passes for the 'residents only' scheme. Fluffy white Egyptian cotton - 2 per guest. Comfortable two-seater sofa and armchair; coffee table, side table and hall stand. Selection of tourist guides and fiction and non-fiction books, maps and travel information. Breakfast coffee and tea provided free of charge. A wide selection of tourist and museum guides,fiction and non-fiction books, together with an A-Z map book of central London and travel information. The Stables are within The Old Bakery's delightful walled garden and have a private sitting area with a table and 2 chairs. Secure gated access to the street. The garden is a much admired feature. A pleasant seating area with table and 2 chair outside The Stables, within the walled garden of The Old Bakery. Excellent visitor information about central London attractions and about the local area is provided. Visitors also enjoy the varied selection of books. Wireless internet access is free. The Stables stand in the delightful walled garden of the Old Bakery. During the Spring and Summer months our garden is full of flowers, including clematis In May-Sept and roses round your door in June! Our guests appreciate the peaceful atmosphere after a busy day's sight-seeing. The garden provides a pleasant and secluded place to sit on summer evenings. Many birds come to our feeders. A high gate gives direct access to the street, while providing excellent security and privacy. Please note the bedroom is accessed via a ladder-staircase and that this is unlikely to be suitable for persons with limited mobility. Please email or ring us to discuss the suitability to your needs. Thanks for staying. Glad you enjoyed our Stables cottage and our great location. Hope to see you again. Great place if you have a car. Easy train to London City. Loft bedroom can be challenging and a little unnerving at first. Very private accommodation. Staying at The Stables in Winchmore Hill was an absolutely wonderful experience. The town is a quiet, lovely respite very close to the city and the train station is about a 3 minute walk to the property. The Stables is the kind of place I could have stayed at for a month and had everything I need. Beautiful patio and a really lovely and cozy loft make this one extraordinary. I’ve stayed in many VRBO’s. This one stands out. The host, Nina, was also excellent. She went above and beyond for me, even walking to the station when I got mixed up and went the wrong way ( a dumb mistake on my part ). What I appreciated the most were her written suggestions about what to see. I wouldn’t have known about several amazing places, such as Kew Gardens, which is now one of my favorite places ever, if she hadn’t suggested them. Five gigantic stars for this one. I loved every moment and I’ll definitely be back !! Thanks so very much !!! We very much enjoyed meeting you and hope you will visit again soon. So glad you enjoyed Kew Gardens. My wife and I thoroughly enjoyed our stay at the Stables. The hosts were great with plenty recommendations for local restaurants, coffee shops etc. would give it 5 starts but some rooms were a tad dirty (eg dusty, cob webs etc) and the double bed was a smaller than you're used to. Overall great stay though and would highly recommend it! I am really sorry that these guests found part of The Stables a bit dusty. That is not up to the standard we expect and aim for. The accommodation is cleaned throughout between each guest and our cleaner is usually very careful. I will, of course, check it out and see if we need to make some changes to the cleaning routine. The bed in the Stables is a small double-size. I.e NOT a king-size. So it is, indeed, smaller than the size many people are now accustomed to. Our other, larger apartment, "Chalkley's", has a king-size bed. The bedroom in the Stables is in the eaves of the building and so space is more restricted. We state this in the description of the Stables and its facilities, where the bed is listed as a "small double". We are sorry that these guests were expecting a larger bed. We are glad that the guests enjoyed their stay generally and hope that they will visit again, but perhaps choose the other apartment, Chalkley's. We thoroughly enjoyed our few days at The Stables, which was the perfect place to come back to after a busy (and in our case hot) day in the city. So convenient for the station, shops and pubs/restaurants - and enjoying a relaxing glass of wine in the evening in the garden was the icing on the cake. Will certainly recommend and book again for our next London city break. Thank you, Nina. The little cottage was as described and Nina was a gracious and helpful hostess. Easy access to the London Overground and Tube system and an Oyster card made it simple to see the sights. The cottage was equipped with everything necessary for a comfortable stay. Would go back in a heartbeat. Thank you to this guest for the kind review. We were delighted to welcome her to the Old Bakery and hope she will return soon. Winchmore Hill is a pleasant residential area of London from which trains take you to the West End's theatres, museums, galleries and shops in just 25-30 minutes. The City (St Paul's Cathedral, The Millennium Bridge, Shakespeare's Globe, Tate Modern) is equally accessible by train. The Old Bakery (a working bakery known as Chalkley's Bakehouse until 1945), is one of a group of 17Th century buildings near the 'village' Green, which is a historic Conservation Area. The Green has charming pubs, restaurants and traditional tea-rooms, as well excellent food shopping. In the 1660s, Winchmore Hill became one of the earliest Quaker communities, founded by George Chalkley. His son, Thomas, emigrated to America and became a famous preacher. The Quaker Meeting House and the Old School House are nearby. The university City of Cambridge can be reached by train in 1 hour 15 minutes, and beautiful Hatfield House (where Queen Elizabeth I lived before becoming Queen) in 45 minutes. Rates for stays of over 2 weeks may be negotiable at certain times of the year.